When you think of charming sidewalk cafes and bistros, adorable patisseries and streets lined with colorful awnings and pots overflowing with flowers, you're thinking of Pittsburgh, non? Well, the city's hoping you will. 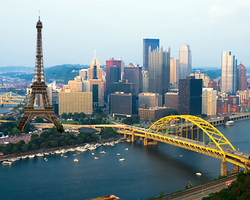 The Pittsburgh Downtown Partnership has set up a $2 million grant program to help give the city of steel a little European flair. Under the program, matching grants can be used for a multitude of improvements, including awnings and umbrellas, flower boxes, outdoor tables and chairs, heating lanterns for dining in cooler weather, lighting, signs, landscaping, outdoor music and better access. To the city, we say bonne chance. And, hey, it could turn out great -- it's not like we can afford to travel to the real Paris anymore.